On Wednesday, September 26, the FDNY’s first-ever all-women staffed Engine Company was detailed to Engine 503 on 51st Street in Manhattan. The unit was part of the FDNY’s resources assigned to provide fire suppression protection during the UN General Assembly. Members assigned were: Lt. Tracy Lewis, Firefighter Martha Brekke, Firefighter Eniola Brown, Firefighter Vanessa Schoening, Firefighter Sarinya Srisakul, and Firefighter Regina Wilson. 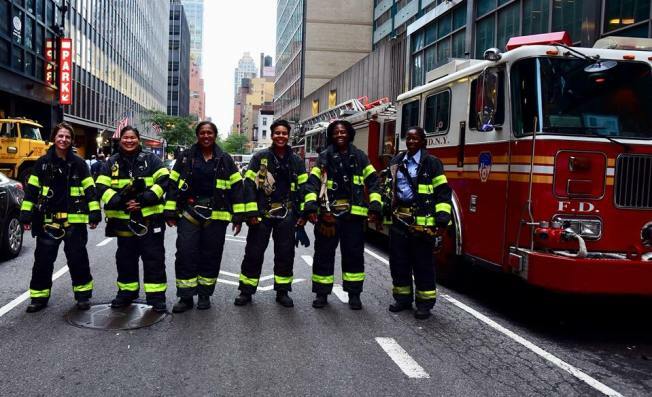 The FDNY’s first all-women engine company has been detailed to a firehouse in Manhattan. The six-firefighter company was detailed to Engine 503 on 51st Street in Manhattan, the FDNY said in a Facebook post. The company includes Lt. Tracy Lewis, Firefighter Martha Brekke, Firefighter Eniola Brown, Firefighter Vanessa Schoening, Firefighter Sarinya Srisakul and Firefighter Regina Wilson, the FDNY said. “The unit was part of the FDNY’s resources assigned to provide fire suppression protection during the UN General Assembly, the department noted in the post.